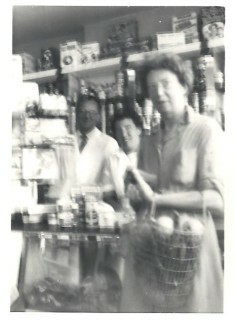 Inside the shop in the 1950s with Mr. Ralph and his shop assistant Brenda. 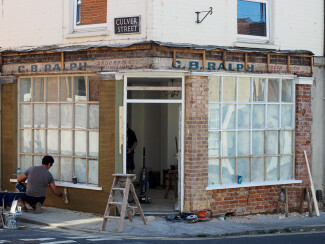 Mr. Ralph's son David thinks the customer may have been Mrs. Izzard of Culver Street. A travelling knife sharpener outside C.B. Ralph's grocer's shop at 68 Milford Street. Probably 1950s. The window display at C. B. Ralph's grocer's shop, 68 Milford Street. Probably 1950s. No. 68 Milford Street is on the corner of Culver Street, diagonally opposite the site of Foster’s the bakers. In recent years this was a bric-a-brac shop, previously Regency Tiles and before that Bob’s Tiles. 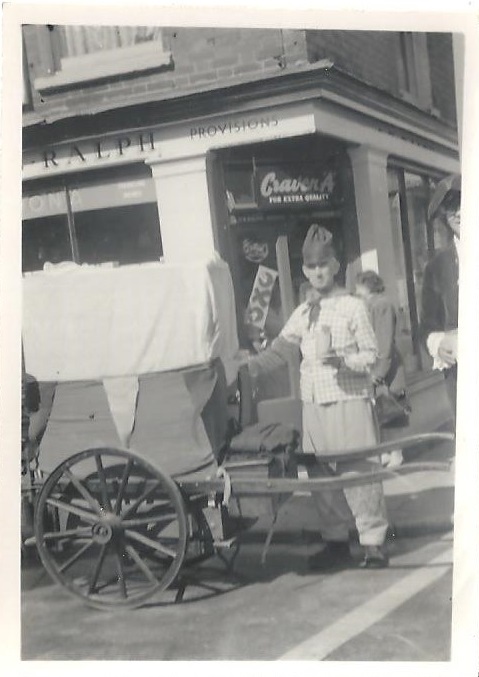 Between 1945 and 1967 it was home to C. B. Ralph’s groceries shop, run by Charles Ralph. The shop was renovated during the summer of 2016 and the work revealed the old signs for Ralph’s the grocers. Our friends at the Fisherton History Society Facebook group put up a photo which attracted many comments from people who remembered using the shop. 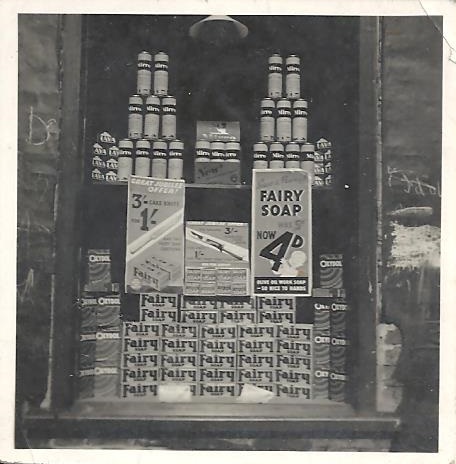 David Ralph has very kindly sent us a wonderful selection of his photos of life in Milford Street from the 1950s and 60s. We are working on a new page so that we can do them justice and will include the link here when it is ready. Mrs Ralph was my father’s cousin and, when we were living in Rampart Road, my mother often went into the shop on the way back from town. Usually, she bought ham and I loved watching it being sliced on the large machine, recalling the smell even now! Until I was eleven, however, I was not supposed to go to the shop on my own because of the milk floats and lorries turning into Culver Street or Milford Street. Nevertheless, when running errands, I did so if I could not buy what my mother wanted in Coleman’s or Percy Churchfield’s Dairy! Once we moved to Harnham in 1969, we lost touch with the Ralphs but I passed their shop each evening as I drove home from Andover; a sad reminder of a community destroyed by thoughtless town planners!